Grand Rapids, Michigan, filmmaker Rob Bliss is a storyteller with a masterful understanding of how people communicate. He’s known for fun stunts and videos, like The World’s Largest Zombie Walk. 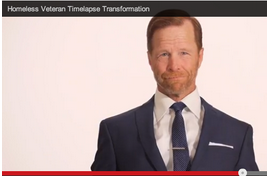 But this remarkable time lapse video – produced to help Dégagé Ministries get the word out on how they help homeless veterans – has a more serious message. 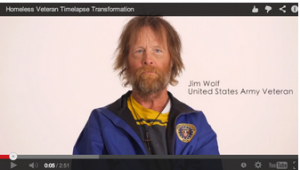 The video focuses on the transformation of Jim Wolf, a US Army veteran, and it has had nearly 13.5 million YouTube views since Nov 6. Dégagé takes a back seat to the story – and that’s exactly why it can gain this kind of traction. Degage’s executive director, Marge Palmerlee, said she’d like the project to help change the way people look at the homeless, so they can get the help they need. A team of volunteer stylists worked to give Wolf an extra boost of the kind of confidence which is so often tied to public and employer perception of external appearance. Wolf, who had not seen himself throughout the transformation, said “wow” when finally saw his reflection in a mirror. Then he got up and gave Bliss a great big hug. Since the makeover, Wolf’s found his own apartment and attends Alcoholics Anonymous meetings regularly.